Rather than trying to figure out what to do, you can just call us instead. After all, we’ve been handling SC workers comp cases for over 28 years. In addition, Mr. Reeves is a former insurance defense lawyer and former Registered Nurse (RN). As a result, he understands your injury and knows how to work with adjusters to get your benefits started quickly. Because time is critical after a serious injury, call now for answers and options. While you focus on healing, we will focus on your case. Furthermore, we will explain what you are facing and what to expect. Because they have never been through this before, most of our clients don’t know how this works. As a result, they are looking for answers and options. In addition, they want to know about medical treatment and how they are going to pay their bills while unable to work. While SC workers comp laws are complex, try not to worry. After all, this is what we do, and we have helped many families just like yours. So let us worry about your case, and you just get better. 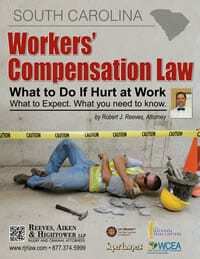 Attorney Robert J. Reeves has practiced workers’ compensation law for over 28 years. Consequently, as a former insurance defense lawyer, he knows how to work with adjusters to resolve your case. And if a claim is denied, he can request a hearing to fight for you in court. In addition, as a former Registered Nurse (RN), he understands complex injury cases. Over the years, Mr. Reeves has dealt with almost every type of serious workers’ compensation injury case. Rather than trying to do this on your own, let Mr. Reeves handle your case. Then you can focus on getting well and back on your feet. Because SC workers comp law is limited, it is important to know what benefits are available. So here is what you can get in an accepted claim. First, you get medical treatment for your injuries. However, the carrier chooses the doctor, and all care must be authorized. In addition, you get weekly benefits but are limited to 2/3 of your usual pay. And finally, you receive disability if you suffer any permanent impairment from your accident. While pain and suffering applies in other cases, it does not in a SC workers comp injury. Consequently, experience matters as every dollar counts in workers compensation cases. Because choosing the right SC workers comp lawyer can make a real difference, carefully compare our credentials and experience. Before making a final decision, call us to schedule a private and confidential review of your case. We will answer your questions and then give you possible options. At that point, you can then decide who is the best SC workers comp lawyer for your case. So call now and let’s start your road to recovery. Our law firm proudly serves residents throughout South Carolina, including those in the greater York County SC area (including Charlotte, Fort Mill and Rock Hill), the Columbia, SC area (including the counties of Richland, Lexington, and Kershaw), and the Charleston area (including Charleston and Dorchester Counties). **Membership in legal organizations is intended to demonstrate our commitment to excellence in the legal profession. Because every case is different, the final outcome and value depend on individual facts. Only after a thorough review of all evidence can a lawyer give you a full assessment of your situation.